The United States Supreme Court overturned a District of Colombia Circuit Court ruling that had been holding up the enactment of The Cross-State Air Pollution Rule. CSAPR, the brainchild of the Environmental Protection Agency (EPA), states that power plants across 27 different states must diminish the use of pollutants that drift downwind. Certain types of pollutants, like sulfur and nitrogen, not only have a tendency to drift down to levels where they can be destructive to lung tissue after being inhaled by humans, but also have the ability to travel across state lines. The EPA estimated that once put into practice, the new rule could prevent 19,000 hospital visits, 420,000 cases of respiratory symptoms, and nearly 2 million sick days taken from work or school by those affected. Potential total financial savings tally up to $280 billion in various health and environmental costs. 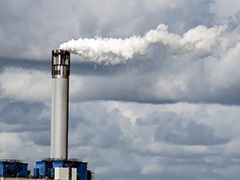 CSAPR will close a loophole in the Clean Air Act by requiring that power plants meet emissions goals, and it may necessitate that some of them switch to different types of coal that emit less sulfur, or adopt technologies that prevent the downwind emissions. More than 1,000 power plants will be forced to adhere to the new guidelines. While the environmental and health benefits of these guidelines are clear, detractors of the new rule contend that costs are bound to go up while energy efficiency of the plants will plummet, killing jobs and placing a strain on the already fragile economies of many of the effected states. But supporters of CSAPR point out that workers at the plants want clean air and safe environments for their families, and that the massive benefits of the new rule far outweigh the potential economic downsides. While the new rule is effective immediately, definitive changes at the plants have yet to see the light of day. Posted on May 5th under Pollution Reduction.